ZARZAR MODELS - Modeling Agencies Los Angeles, Orange County, San Diego, Las Vegas, Miami, New York: ZARZAR MODELS - San Diego Magazine Cover & High Fashion Editorial Spread! 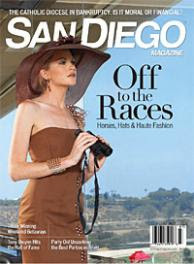 A Look Back In Time Into "The Agency"
ZARZAR MODELS - San Diego Magazine Cover & High Fashion Editorial Spread! A Look Back In Time Into "The Agency"
Produced by San Diego Magazine. Styling by Dianne O., 619-269-6644; dianneo.com. Hair/makeup by Valerie JC, 310-877-1706; valc@iconimage.net. Models: Dianne Stevens, ZARZAR MODELING AGENCY, San Diego, Southern California; and Caleb King. Jockey: Jeffrey Bloom. Trainer: Carl O’Callaghan. Shot on location at the Del Mar Thoroughbred Club. ZARZAR MODELS is San Diego's #1 modeling agency and home to San Diego's most beautiful women. The agency is also one of Southern California's most prestigious modeling agencies representing and recruiting models throughout the world, including models in Beverly Hills, Los Angeles, San Francisco, San Diego, Las Vegas, Miami, New York, London, Milan, Paris, and Sao Paulo, among other fashion capitals of the world.